Makiwara. 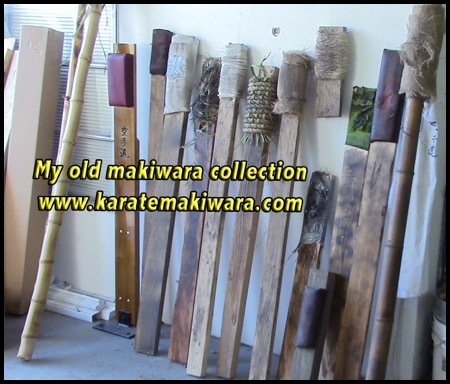 Your top quality source for the best quality crafted makiwaras designed to help you properly develop makiwara body dynamics with proper use of our effective and well handcrafted makiwaras. United States Patent and Trademark Office, Assignment Number #122266. Like us on Facebook, Makiwara Guy. *BE ADVISED THE DUE TO HAVING TO DEAL WITH GOVERNMENT CORRUPTION AND FILING CIRCUIT COURT FILINGS, I HAVE SUSPENDED MAKIWARA PRODUCTION UNTIL RESOLVED. No Makiwara sales until my 8 cases have been resolved. 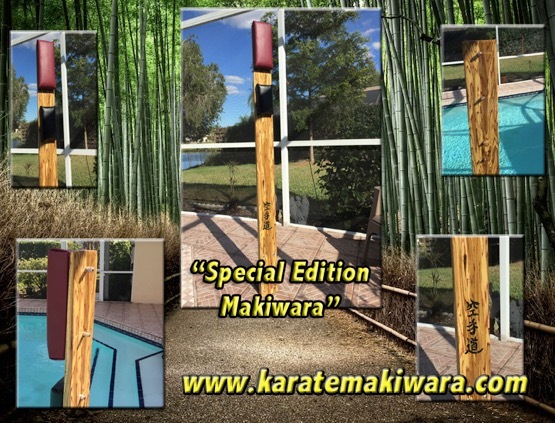 Send us an email and place an order for the special edition makiwara. Limited supply currently. Our makiwaras have been shipped to six of the seven continents including Europe, South America, North America including USA and Canada, Australia, Africa and several island nations. What a pleasure to see people using an effective makiwara and enjoying makiwara training. Original makiwara’s were designed to toughen the hands (in particular the knuckles) and to strengthen the wrists resulting in powerful punching and breaking techniques. 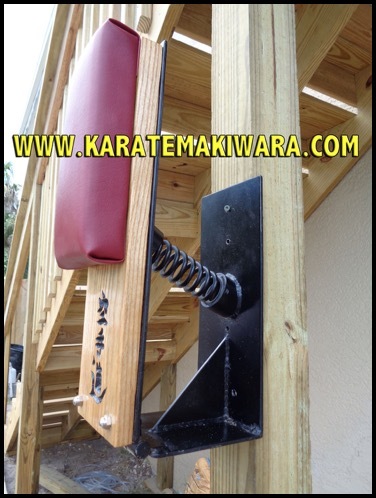 Our modern http://www.karatemakiwara.com makiwara’s are not designed in that way due to obvious injury with the new focus being on developing and mastering proper body mechanics working in synergy. Careful, consistent training and practice with a properly and well crafted makiwara, causes the body to learn the use of proper body dynamics generated from the ground through the foot, which is to be well grounded, up to and through the lower leg (ankle and calf), then with use of the bend at the knee power is further generated up and through the large thigh muscles to the hip, where the rotation of the hip and the torso with the continuous connection to the ground begins to generate tremendous power and body dynamics if done correctly. This power is then generated to and through the axis of the spine which rotates and transfers power to the shoulders (which are lowered, not tensed) to the arms and the bend at the elbow which begins to exert power towards the target. While the hikite (reaction - opposite arm) is retracting in a counter movement to facilitate in the rotation while pulling the opposite shoulder and upper torso back creating a counter movement. To purchase your own handcrafted makiwara, go to the purchase page. As the arm begins to straighten, the body is to have a dropping and heaviness motion thereby connecting from the ground all the way up and through the body to the well-formed fist, all the time the body is in a relaxed whip state in order to create a rapid, fluid and connective motion. As the first two knuckles of the fist at the index and middle fingers protrude outward in this wave motion (with the metacarpal bones of the hand in line with the arm bones and not bent), the body drops in a heaviness manner, thereby creating power from the foundation of the ground and the use of the connection of all the body parts in conjunction to create a wave motion to the makiwara. This motion and with regular repetitive exercise helps to foster your martial arts training. In two pieces to facilitate shipping with double aluminum plate for easy assembly. The entire motion is to be relaxed and deliberate with the mind at ease and not tensed. This is where speed is generated. Unlike stiff and stressed muscles, these relaxing movements coupled with a relaxed mind creates a unique and yet fun training exercise, which with time and continued training develops effective striking and blocking techniques that can be fostered into lighting and dynamic movements. If done correctly, makiwara training should be enjoyable and fun, not painful and arduous. Daily practice is essential and aids in developing punches, kicking and blocking techniques along with helping kumite and kata training to become more and more fluid and sharp. The http://www.karatemakiwara.com makiwaras have flexibility and resistance and offer significant training aids without causing injury. It is recommended that you do not try training on your own without the assistance of a qualified martial arts instructor and insertuction on how to properly use your new makiwara. 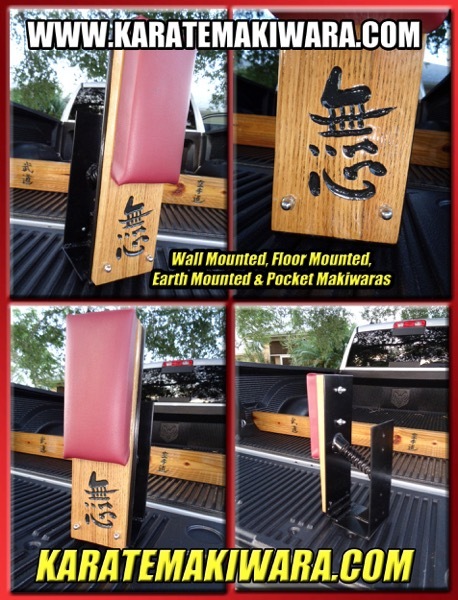 Our makiwaras are NOT designed to give you callouses or make your knuckles bleed. Also rope on a tree does not offer the correct flexibility required to develop proper body dynamics and technique. As a matter of fact; broken bones, strained muscles and infections are common with other types of makiwara. This is dangerous and must be avoided. The makiwara is a training aid for the development of technique more than anything else. Proper training should be enjoyable and never painful. Makiwara also aids in kata (forms), kihons (basics), blocking, punching and kicking techniques. Along with being a great target aid. 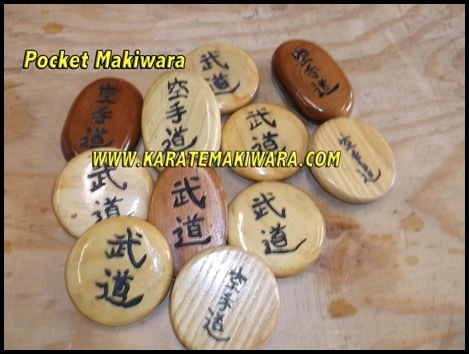 We also offer pocket makiwaras, hand crafted and carved along with makiwara art plaques to be mounted at your home or in your dojo. Makes a great gift as well. Pocket makiwara are also a reminder of your commitment and karate-do life. To purchase your own handcrafted makiwara, go to the purchase page. 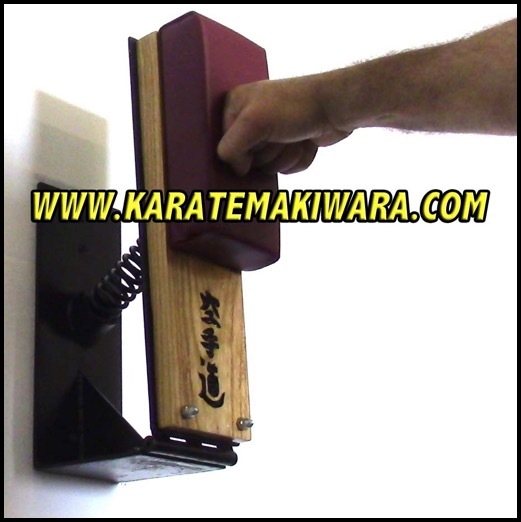 Makiwara is the essential tool for all types of martial arts, whether it be karate, mixed martial arts and aikido. 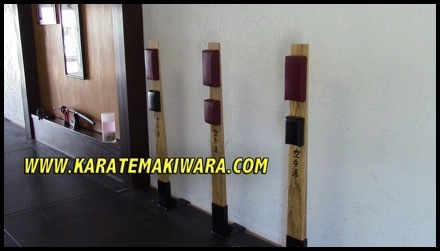 Boxers have also used the makiwara with success. 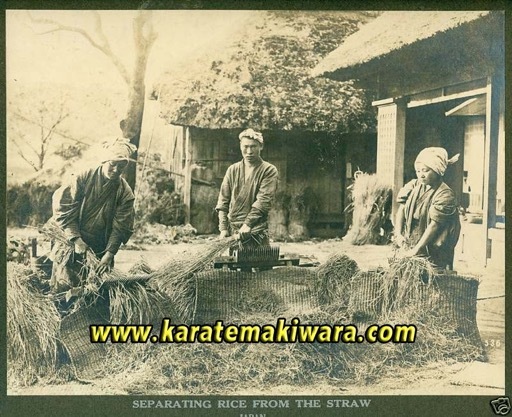 The literal translation of makiwara breaks the word into two parts: maki which best translates to “roll up” or “wrap”, while wara translates to “straw.” Referring to rice straw. The traditional makiwara was a “striking post” consisting of a bundle of rice straw wrapped vertically and horizontally. 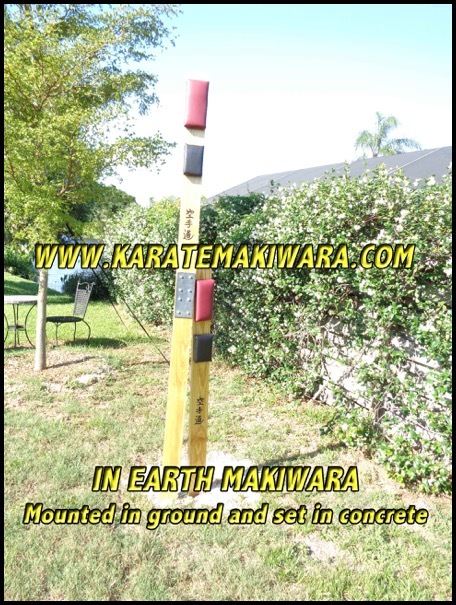 The next generation of makiwara used coils of rope fastened to a board which has one end buried in the ground to make it sturdy with some flexibility. 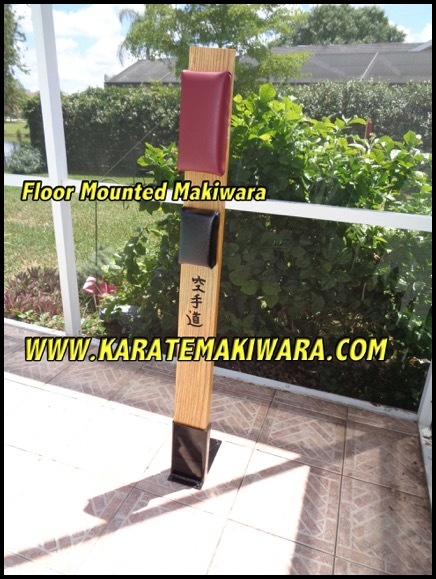 Our http://www.karatemakiwara.com makiwaras, offer marine grade paddings to prevent injury, tapered wood for flexibility along with welded steel bases for mounting on walls or on concrete. And the spring mounted makiwara which has become very popular is great for mounting on many walls. EACH MAKIWARA IS HAND CRAFTED FROM THE RAW MATERIALS TO THE FINAL PRODUCT BY THE MAKIWARA GUY ARTIST. Makiwara Guy, makiwara artist has trained in Shotokan Karate for over 35 years and first used a makiwara at Stan Schmidt's School of Karate in Johannesburg South Africa where Makwiara Guy started training in karate. Eventually Makwiara Guy was invited and a part of the early bird instructor training. Many years of training, study and passion for makiwara have produced makiwara's that Makiwara Guy produces in the Makiwara Shop. in Bradenton, Florida USA. 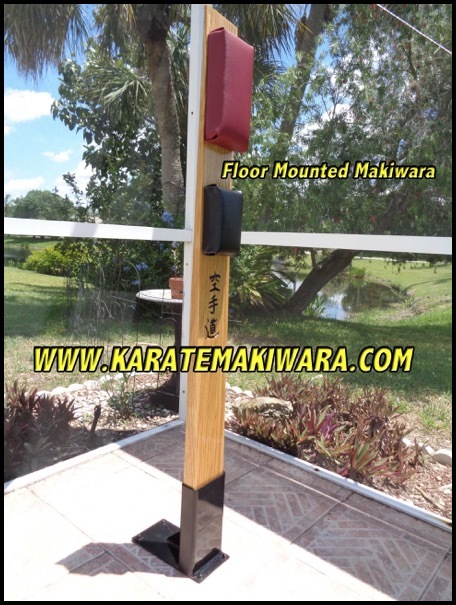 Makiwara Guy has been a part of Rick Hotton Sensei's karate school in Sarasota, Florida since the mid 1980's and travels around the world with Rick Hotton Sensei teaching and encouraging.